StellaBella: Wednesday Food: Asian Delight! On my recent trip back home, my mom was cleaning out her cupboards. 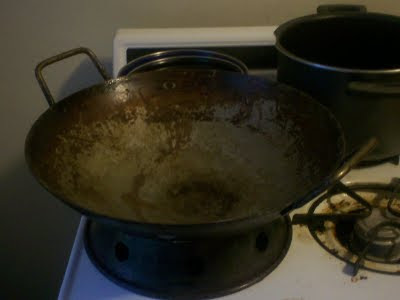 She asked if we wanted her wok, something she rarely used, but had kept it for MANY years. She figured us culinary grads would get better use out of it. How could we say no? Since, we've made many Asian dishes, such as Orange Sesame Chicken, as well as cooking a lobster in it. 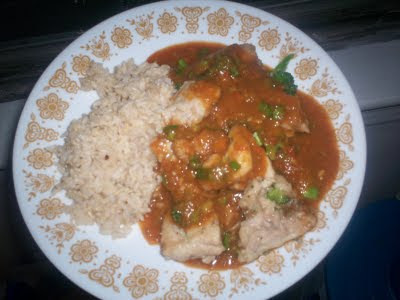 But tonight, it shall be Sweet and Sour Chicken w/ Broccoli and Brown Rice. 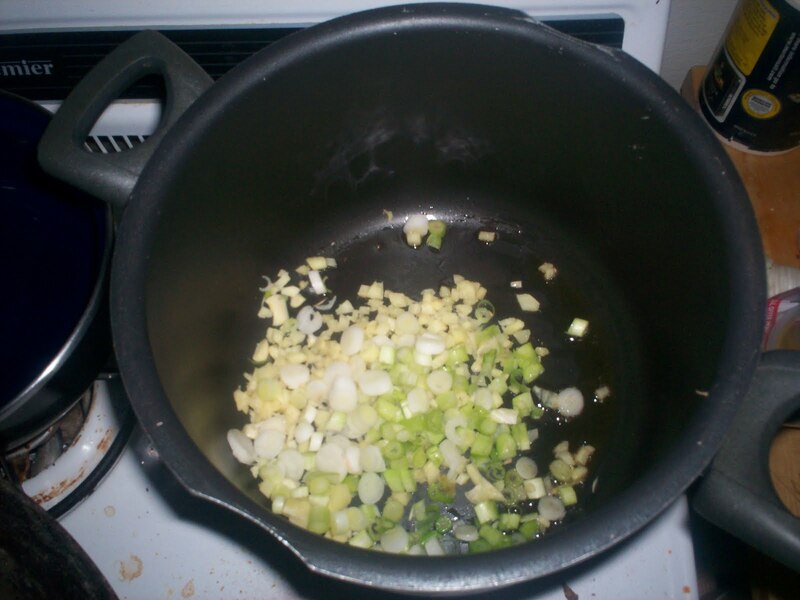 The basic or foundation ingredients for any Chinese style meal is scallions, garlic and ginger. Without them, the flavor profile is kind of incomplete. Adding soy sauce alone does not cut it! 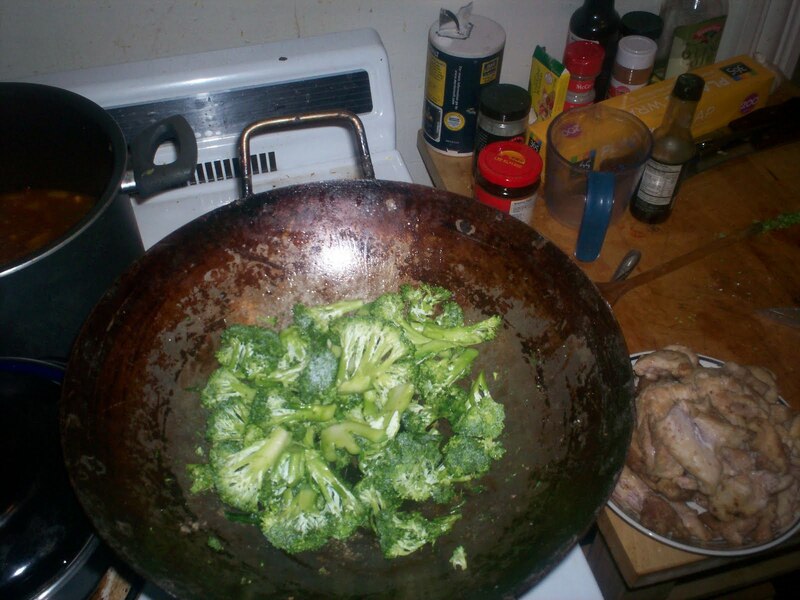 If you aren't lucky enough to have a wok, this can also be done in a large skillet or cast iron pan. 1) This part can be done ahead of time. Saute the scallions(white parts), ginger and garlic in the sesame oil. Cook for about 3-4 minutes. Add the chopped peppers and cook for another few minutes. 2) Add the orange juice, zest, pineapple chunks and juice, hoisin sauce, soy sauce and bouillon cube. Cook it all for about 20 minutes, till veggies are all soft. Turn off the heat. 3) Puree in a blender till smooth. Add the chopped green scallions to the pureed sauce. Hold aside. After the sauce is done, you can start the rice. This is something I kept having issues with and it drove me crazy because it was just rice! How hard could it be?? But with a little practice and Eric's tips, it got much easier. With regular white rice, the ratio of water to rice is usually 2 to 1. With brown you need a bit more water. We did 2 1/4c. of water to 1 cup of brown rice. 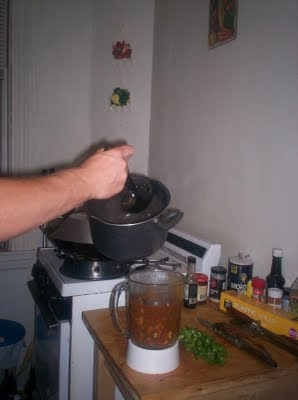 1) Put the rice in a small pot, preferably an EnamelWare pot. They are fantastic for many things especially making rice. Turn the heat on medium and begin to "toast" the rice. Stir often to make sure the rice doesn't burn. The purpose of this is to loosen up the starches so it doesn't stick quite as much. Do this for about 2-3 minutes. 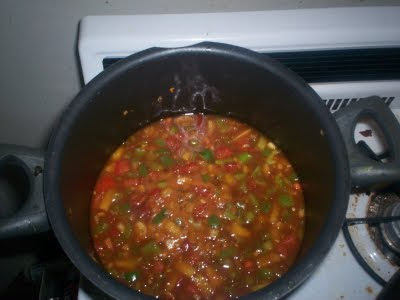 2) Add the water, stir, cover and turn the heat down very low. 3) In all, the rice will take about 40-45 minutes. After the first 20 minutes, stir the rice a little, shut off the heat and cover again. Let the residual heat finish the rest of the 20 minutes. While the rice is finishing its cooking, you can start the chicken. If your cooking in a wok, they get very hot, so the cooking process goes pretty quickly. 1) Take your chicken (about 1 1/2 lbs.) and cut it up into small pieces. 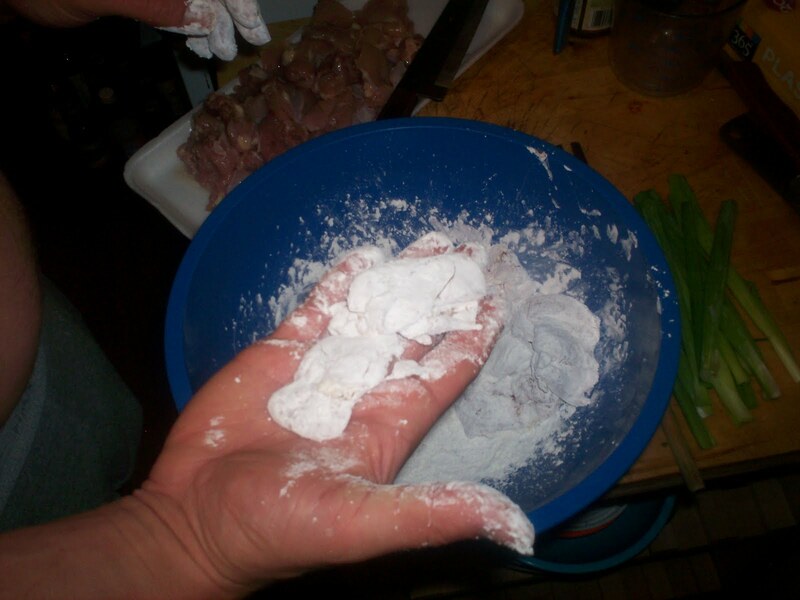 Coat the chicken in cornstarch (this makes it nice and crispy). Heat the wok and pour the sesame oil around the edges and let it drip down to the center. 2) Place the chicken in the pan and cook till browned and cook all the way through. This will go quickly in a hot pan or cast iron so don't walk away! Drizzle the sesame oil around as needed. When the chicken is done, then set it aside. 3) Get your head of broccoli cut up and add it to the wok. It will have to be stirred pretty diligently so that it doesn't burn. (hence the term stir-fry). 4) Once the broccoli has brightened to a lovely green and softened then add the chicken. Stir and add your sweet and sour sauce. You may not want to add all of it. We actually just ladeled the sauce over the chicken and broccoli. Yummy, yummy, yummy! As always, you can get creative with this recipe. Add different veggies like carrots, baby corn or snow peas. You can also switch up the meat and cook with beef, pork or tofu. To give the sauce some spice, we added some red chile powder to it. Have fun! 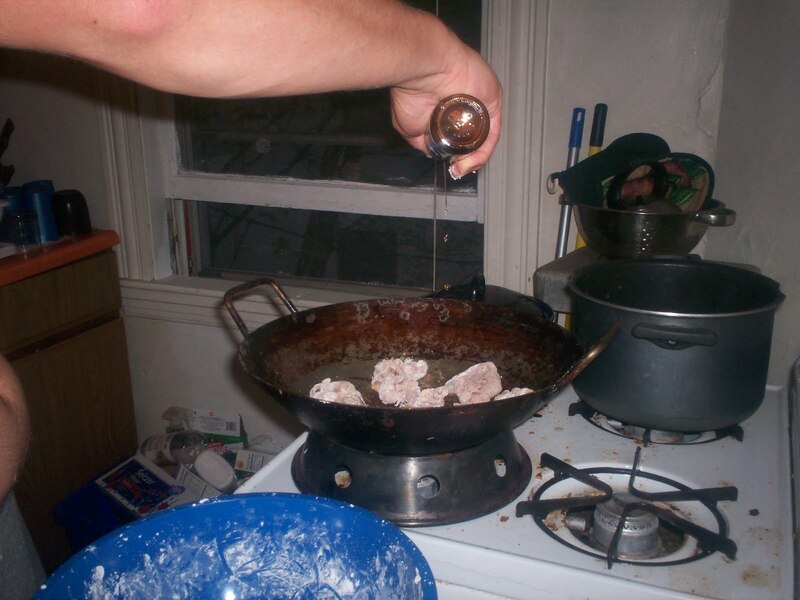 Remember when the kitchen gets too hot, get back in there and keep cooking!